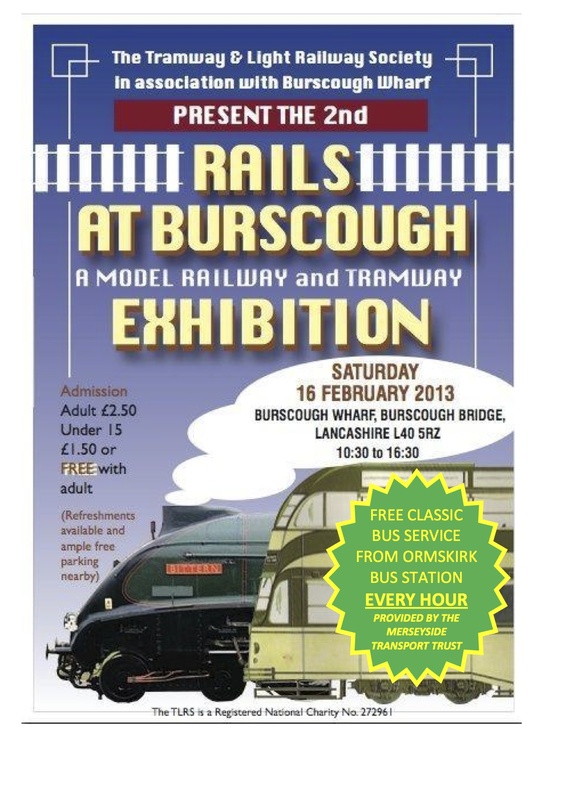 The Tramway & Light Railway Society, in assocation with Burscough Wharf, proudly present the 2nd Rails at Burscough Exhibition on Saturday 16th February 2013. There will be several model railway and tramway layouts in attendance, as well as various trade and information stands. The Friends of the 502 Group will also be there, so if you want the latest news from the 502 (or you want to set up that standing order – hint!) pop in and have a chat to one of our members. It couldn’t be easier to get to Burscough Wharf for the exhibition. Not only is there ample free parking nearby, but our friends at the Merseyside Transport Trust are providing a free shuttle bus service from Ormskirk bus station (a 2 minute walk from Ormskirk railway station). 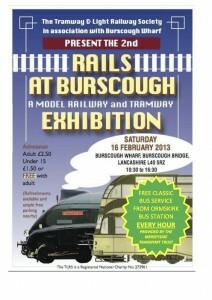 Buses run hourly from 10am, with the last bus back to Ormskirk departing from Burscough Wharf at 4.30pm. Admission to the event is just £2.50. Under 15s pay only £1.50 or are admitted free of charge with an adult.